This entry was posted in Exterior Shades, window coverings. Bookmark the permalink. 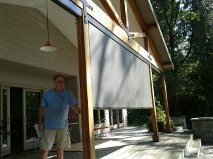 Exterior shades seem like they would be perfect for patios. There were a few times last summer when I wanted some shade while having lunch on my patio. The guy in the picture looks like he’s pretty relaxed from all of the shade those blinds are giving him, so I might want to have this for my home. Thanks for posting this!